Jamaat-e-Islami is a political organization which appears to rule the hearts and minds of a majority of urban people in Pakistan despite their dismal electoral performance. This statement would be heartening for a supporter of the Islamist party still struggling to make a dent in the secular wall of Punjab and Sindh. One of the reasons to demonstrate that is the complete lack of checks and control over their band of young fascist goons, the Islami Jamiat Talaba (IJT). Any given elected civilian government and even the military establishment are heavily under the influence of their ideological supremacy. They promise to establish Sharia in Pakistan despite having already influenced the theocratic elements in the Pakistani constitution. This is other words means that we are a work in progress to reach the excellence of the Islamic State (in Iraq and Syria). The IJT are in the news again for disrupting a cultural event in the public educational institution Punjab University held by a secular Pashtun student organization PSF. This obviously resulted in a clash that has seen many injured and the environment of calm and peace destroyed for thousands of students in Lahore. Yes, this is Punjab we are talking about. This is not for the first time of course and it surely would not be the last. Just a simple internet search about news related to them should suffice. Exhibit A.
I wish it would be the last straw that would have us say that enough is enough. The pioneers of violence in student politics and the prime factors resulting in the creation of counter fascist (not counter-fascist) secular movements like APMSO, the Islami Jamiat-e-Talaba (Islamic Student Organization) has remained a menacing force in politics in Pakistan. The Islami Jamiat Talaba pretending to be representative of a democratic party and democratic values, always resort to violence for a reason. Because they actually work on a theocratic logic (which is never democratic) and are trained to silence everyone that holds a different world view. Because that is just the way religion works. Also, it is about time we stop buying the same arguments about the alleged democracy of their mothership, the Jamaat-e-Islami, because that is precisely how they work as well. At least they promise Sharia in their manifesto in addition to what we have in Pakistan. Their so-called democratic process of electing an Emir is the biggest farce you are ever going to see. Offering us the worst of the both worlds, the IJT is a mixture of toxic Islamist ideology and second hand anger fueled by misplaced male hormones, a trait they share with their secular brethren. This group of goons, just like the undemocratic party they represent, should be immediately banned from participating in politics nationwide in educational institutes at least. And there are valid reasons why. Ask yourself this question honestly. How many times have you heard the activists of Islami Jamiat-e-Talaba have disrupted cultural and educational activities? While I know that the secular and progressive student unions do not have a clean sheet to offer as well and I am not a fan, there is simply no parallel when it comes to the history the Jamiat enjoys. And that too, completely unchecked. Even in the overwhelmingly theological International Islamic University Islamabad, the organization (which enjoys a complete totalitarian control there) has been known to disrupt mixed gender conferences in its relatively and nominally secular business school. I know a lot of my friends would disagree and I would understand, but I was relieved that student unions were banned by military dictators during my days in college. Because that offered the students some peace due to the break in regular violence. Still in those days, the Islami Jamiat Talaba (IJT) enjoyed unchecked influence not only in institutions heavily funded by Muslim majority Gulf states but also in various public secular institutions like the Punjab University. They had always been a major force in the Karachi University at least. They introduced weapons and violence in the politics of Karachi under the secure guidance of our state which kickstarted the shitstorm the city is in today. But even that is a smaller and long forgotten crime in comparison to the good work they are doing every day. The biggest reason to ban the Islami Jamiat Talaba (IJT) is simply the fascist, authoritarian, and totalitarian ideology they are poisoning the minds of our youth with. They abuse the freedoms offered by the democratic process to push their theocratic agenda and aim to make Pakistan a far more frightening state than Iran or Saudi Arabia. I know a lot of people would jump to attack this piece as endorsing undemocratic ideas but sadly the IJT and their sympathizers do not know the first thing about democracy. Yes, even the political party of Adolf Hitler won a popular vote election and then suspended democracy. So, just having an election is not democracy, unfortunately. Like other authoritarians such as Communists, fascists and Nazis, the Jamaat-e-Islami, IJT, and their ideology are the very anti-thesis of democracy, make no doubt about it. I know the title of this piece is kind of ridiculous because any time to ban the IJT nationwide is good and it should have been done long ago. And of course, whenever a ban on student unions is indeed put in place, the solution is to punish everyone for their crimes. Because why discriminate against totalitarian theocrats? Thanks to them, we have a theocratic constitution anyway. A big test of the values that you believe in lies in defending the rights of someone you don’t agree with. Zaid Hamid is a commentator with radical views which entwine conspiracy theories with religious traditions, which repulse many liberals, centrists, and conservatives alike. He was recently arrested and sentenced to eight years and a thousand lashes. There is no doubt that every supporter of the Caliphate such as Hamid should be criticized, but that does not take away their right to free speech, even if they are demanding something that would kill the freedom to exercise it. But in this case, the real opponent is Saudi authoritarianism and the consistent abuse of Pakistani citizens at the hands of their abusive state that is supposedly a part of the “Muslim brethren.” Not only have Saudi Arabians barbarically beheaded dozens of Pakistanis for minor alleged offenses, such as drug trafficking, but this time has arrested a citizen for making an inconvenient speech. Of course, you cannot really expect to criticize Saudi Arabia on their soil and get away with it. Most of us have not heard what the content of his speech was, and it is easy to assume that it would somewhat comprise of hate speech, or at least call for rebellion. Nevertheless, the harsh punishment would sound strange to many in Pakistan, or would it? But why go out of our way to defend someone whose views the world is better off without? Because free speech is a value greater than any partisan differences, and also because it is time to show critics and defenders of authoritarianism that free speech is a far superior ideology than theocracy and fascism. This is why the arrest of Zaid Hamid in Saudi Arabia is a tremendous opportunity to show the traditional opponents of free speech why they are speaking against their own fundamental rights, and why free speech is such an important value to defend. While you cannot really expect most Muslim conservatives and Pakistani nationalists to even understand, let alone appreciate and value the idea of free speech, but it is important to show them that this value applies to everyone, no matter what their ideological or philosophical position is. This is why it is of utmost importance that the proponents of free speech, whether liberal or otherwise, should drop their cynicism for a while and support Zaid Hamid in his hour of trouble. It is also important to be concerned for his personal safety, especially because he is a Pakistani citizen, and to call out Saudi Arabia for its brutal authoritarianism and barbaric, medieval penal code. Months ago I wrote about Saudi blogger Raif Badawi, who is still in the custody of the Saudi authorities for speaking his mind about freedom and democracy. Many more Pakistani friends spoke in support of Badawi. Therefore, it is only appropriate that we should speak about this case with the same passion. This should remind everyone that people for free speech are the ones consistent in their positions. 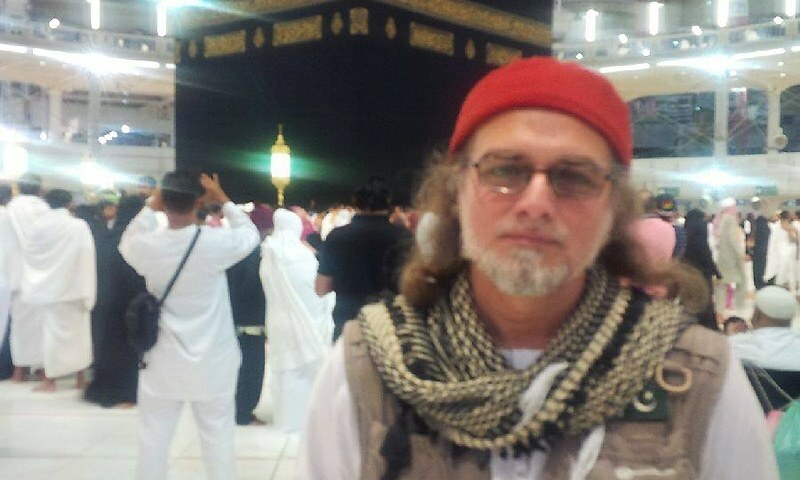 It is not hard to see for anyone, whether the proponents of democracy or the Caliphate, that Zaid Hamid committed no crime and does not deserve such punishment. It is evident that speech is not a crime. And that is why this is the best opportunity to demonstrate this fact to the people opposed to the propagation of free speech, who dismiss it as a Western idea. This is precisely why blasphemy is not a crime and should not be considered a crime by any entity. People in the Caliphate camp should remember that. An overwhelming number of Pakistanis draw many of their life lessons from religion. It is an important part of their personal beliefs that extends to personal relationships, lifestyle, social habits, world view and politics, of course. While religion has its due benefits, it could not have possibly affected an area of life more adversely than politics. Not only does it twist the concept of the government and its role, but terribly destroys the approach of the masses toward politics due to Messianic influences in its teachings. While this sweeping commentary may seem far-fetched to some, it is not hard to observe clear displays in Pakistani politics supporting this notion. None is more obvious than the way we rally around our leaders and how far we are willing to go in our submission. Religious indoctrination has conditioned people in Pakistan to turn political parties into personality worship cults. A good number of political parties devote solemn attention and unconditional submission to their holy leaders. Not very different to the way the local religious people devote worshipful attention to their holy spiritual leaders. Combine that with the Messianic effect and it drives home a very unhealthy approach toward politics, and life itself. It helps followers escape personal responsibility and build unrealistic expectations as far as addressing issues is concerned. And if by accident, or by deliberated effort, a leader is killed, then they are raised to the status of martyred saints. This approach to politics is probably a reason behind the support of dictatorships and monarchies among people in the Middle Eastern and Asian countries. Why bother about democracy when you are willing to give up your rights for a beloved leader? Another problem with personality worship cults is that it deprives a political group of logic and reason, discourages progressive debate and gives way to unreasonable political tactics. But above all, it maintains the golden rule of religions. The authority must not be questioned. And where there are personality worship cults, there are blasphemy laws. Even secular political parties can act like cults, forcing shutting down cities in protest of their leader being insulted. Likewise, you would often see these cult-like parties waste weeks, if not months, over needless juvenile squabbles and obscene name-calling. It always involves one cult party insulting the holy figure of the other, causing wide outrage. As soon as the blasphemy is committed against the party leader, logic and reason are locked out of the debate. And well, then there is no debate. The sooner we move to issues in our political debates, the sooner we would be able to help restore people’s faith in democracy. But while doing so, we need to learn an even more important lesson. Let’s stop blaming others for our problems. Let’s use democracy as a tool for the same. Don’t render it useless by turning it into a war of cults. No, democracy is not perfect. It does not promise you prosperity, or paradise. But that’s no reason to wait for a Messiah, or blindly rallying behind one.